Historical data can be imported from a text file with a ".txt" extension within the Load tab of the Historical Data Window. 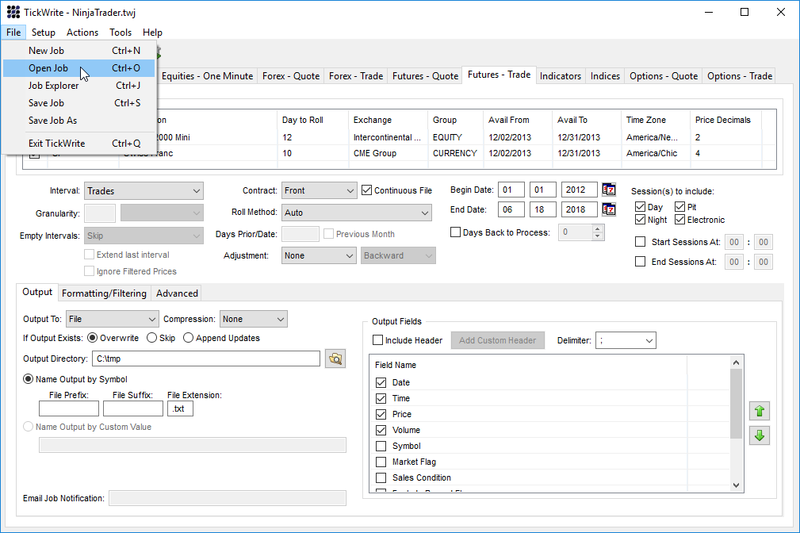 Several formats and data types are supported and NinjaTrader can optionally build 'Minute' bars from tick data as well as 'Day' bars from tick or minute data. Notes: Importing MetaStock data requires the 32-bit version of NinjaTrader. Data exported from NinjaTrader will always be UTC. So when importing data that was exported from NinjaTrader, the Timezone of imported data should be UTC. Select the time zone of the data you are importing (not the time zone you are importing to as all imported data will always be converted to local PC time). If you are importing data exported from NinjaTrader then this should be left as UTC because NinjaTrader exports are always done in the UTC time zone. Select this option to convert the tick data from the import file into historical 'Minute' data. This allows any 'Minute' interval to be available within NinjaTrader. Note: Generating bars from imported tick data is done based off of the timestamps of the tick data. It is possible that the generated bars do not perfectly match minute or daily bars provided by the data provider as they may utilize a different timestamp granularity than your import data for their own bar generations. Each bar must be on its own line and fields must be separated by semicolon (;). Only 1 day bars can be imported. Each bar must be on its own line and fields must be separated by semicolon (;). Only 1 minute bars can be imported. Each tick must be on its own line and fields must be separated by semicolon (;). You can also import tick granularity to the ten millionth of a second. Each tick must be on its own line and fields must be separated by semicolon (;). Tip: You can also import historical tick data to be used with Tick Replay, which includes the current bid and ask prices associated with the last price of that tick (not to be confused with Playback "Market Replay" data which CANNOT import manually). Importing tick replay data without sub-second granularity is less accurate. •If you are importing historical data for a futures or forex instrument, the instrument MUST exist in the database. If it does not, you must add it first via the Instruments window. •Imported data, regardless of time zone, will be converted to the local time zone. Select the text file from your PC to import and press the "Open" button. NinjaTrader will attempt to import the text file. If successful, a window will appear confirming this. If unsuccessful, an error window will appear and you should check the Log tab of the Control Center to view the error(s). When exporting data from Tick Data, LLC with their TickWrite utility, the data must be exported in a format NinjaTrader can import and then the file will need to be properly renamed. Download the following file then unzip it to access the NinjaTrader.twj file: TickDataLLC.zip. Within TickWrite you can go to File and select Open Job to select the NinjaTrader.twj file. Now you can configure what data you want to export and when you execute the job the data will be in the required format.